This Go Green Lunch Box set comes with an insulated fabric carrier, a five-compartment food container, a stainless steel drink bottle, and a reusable gel freezer pack. It is perfect for reducing plastic waste in both kids and adults lunchboxes, and this bento-style box means that there is no need for multiple individual containers. Note: This set currently comes with a purple lunchbox. Buying this product = 75 Reward points for Members. Your cart will total 75 points = voucher of $3.75. Not a Member? Join at checkout to claim these points. Eliminates the need to individually wrap lunch items in plastic or store in zip-lock bags. This reduces single-use plastic from appearing in landfill and is also better for your health. Quality tested to ensure environmental and health regulations are met. Lunchbox and bottle are both FDA and California Proposition 65 approved. 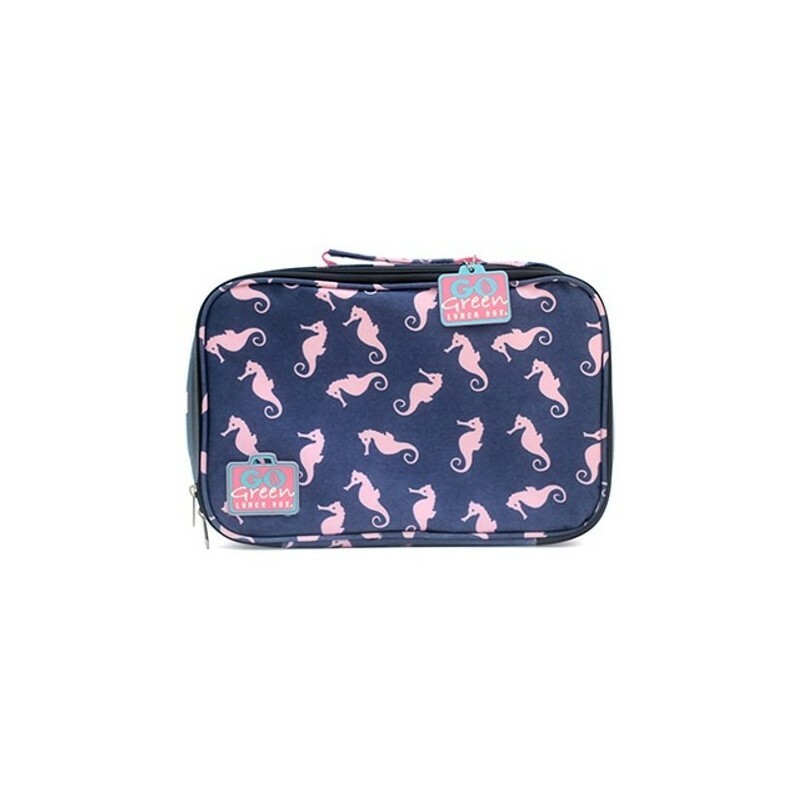 Insulated carry bag is made from PEVA and polyester and features a bright pattern on the outside, and a pocket to hold reusable napkins and cutlery on the inside. Inside of carry bag has a small white board for notes and reminders. Lunch box is completely leak-proof with an easy to use lock on the outside which ensures a leak-proof seal for all 5 sections. Lunchbox can be recycled at the end of its life (recycle 5 rating). 235ml stainless steel water bottle is BPA free and is a great alternative to single-use disposable juice boxes. The ice pack is non-toxic and FDA-approved and will help keep food cool during the day. Reusable. Do NOT freeze stainless steel water bottle. Water can expand inside and crack the bottle. Microwave use for food box not recommended. Wipe carrier clean with a wet cloth. Do not wash or submerge fully in water. Handwash food box - dishwashing not recommended. For best results and to maintain quality, remove the 5 silicone bands and handwash daily. 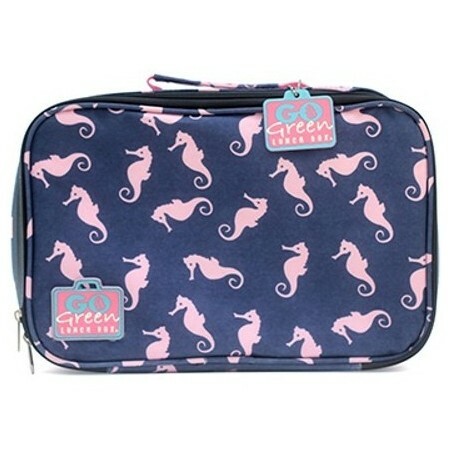 'Sea Horses' patterned carrier bag. 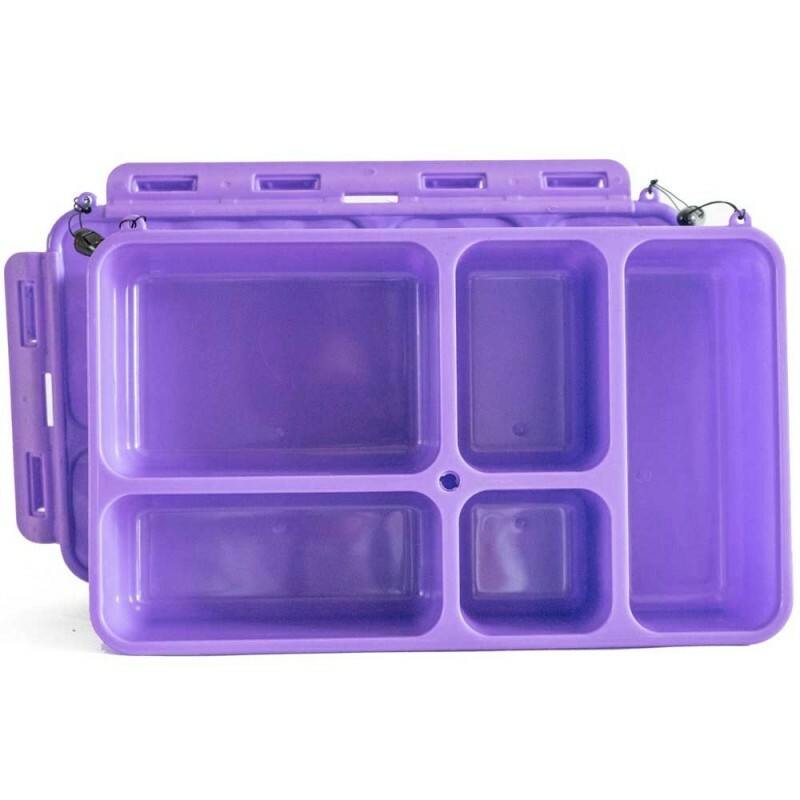 Purple lunch box. Please note we are unable to change the colour of the lunch box. Food box: Exterior = 29.5cm x 17.5cm x 5.75cm. Interior of largest compartment = 14cm x 9.5cm / Polypropylene (recycle 5 rated). Ice pack: 23cm x 9cm / Non-toxic, FDA approved, food-grade carboxyl methyl cellulose (CMC).